OOO! so exciting! Take me with you! Can you believe it snowed again today?? ocean,sun,sand,sun,love & warmth...whats not to love.Enjoy! LOVE all of these; such a pretty presentation too! all of these lovely etsy finds definitely have me pining away for spring and summer! i hope you and the hubs have an amazing time in Florida! 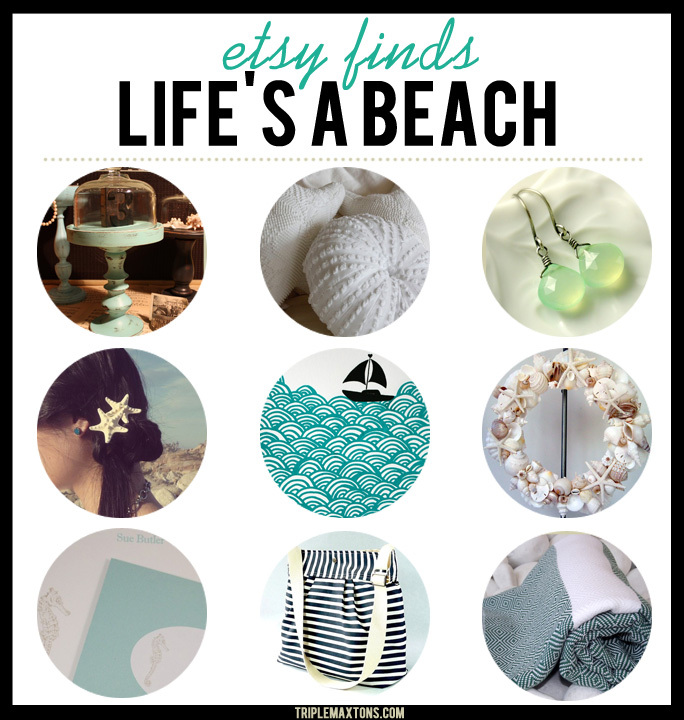 Great beach finds - MUST grab that sea urchin pillow! Thanks for the shout out, and enjoy the beach! My name is Maeve and I am a follower of your blog! I love the look of your blog and was wondering what program you use to make your features? I am somewhat software ignorant and only know how to edit pictures in PowerPoint- any advice would be greatly appreciated!! What a refreshing breezy post! I'm a new follower :) Gorgeous nautical Etsy finds. It's such an honor to have chalcedony Whisper earrings amongst them! Thank you. I'm ready for some sunshine too! Thanks for including my Sea Horse Flat Notes in your beach-y round up! LOVELY!! Thanks for sharing our cloche. Such a fun mix! !